Hola! Here a quick update after our wonderful days in Torres del Paine National Park! 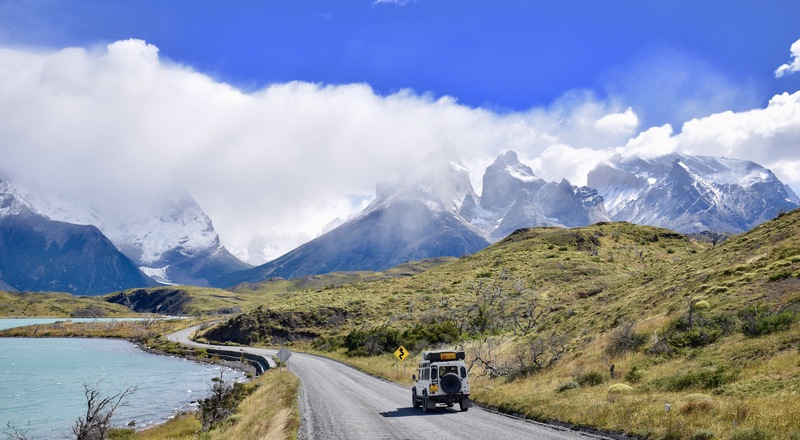 Torres del Paine is one of the most famous national parks in South America. And you can see that! Most people flock to this park to finish one of the famous treks, the ‘W’ or the ‘O’. These are multiday treks (5-8 days) around the peaks of Torres del Paine, and people normally take all their gear and camp along the way. Unfortunately this means that it is now so popular to do this that since October last year you will need to have your campsites booked before even allowed to do the trek. And this results in all camps fully booked, especially now in high season. So we decided not to do any of the multiday treks, but just enjoy the beautiful scenery by day trips, trying to avoid the crowds. When we entered the park from the South we drove up to campsite Pehoe, a beautiful located campsite with the best view on the Torres! A very expensive campsite though, but good facilities and hot showers! The following day we drove around and visited many viewpoints and did some short hikes. We were very lucky with the weather! Some rain, strong winds, but also sun. This is what the park is famous for, you’ll most likely have all four seasons in one day! We ended up at the parking lot of the Visitor center, at the base of the famous hike to Mirador Los Torres. We immediately started chatting with Mike from the UK and Uwe from Germany who camped at the parking lot for the night and decided to do the same. In Torres del Paine it is legal to stay at the parking spaces where there are toilet facilities for free, which is an excellent alternative for the very overpriced campsites. And with Todd and Alex from the US included we had very nice neighbours ;-). We thought we would never camp on a parking lot. But this one, with toilet facilities and a amazing view was not that bad J. The following day it was time to do the hike up to Mirador Los Torres: The famous viewpoint! This day we were not so lucky with the weather… We decided to start early to be ahead of the crowds. But when we reached the refugio around 09:00 in the morning we hiked up 10km in the rain, so we decided to warm up with a coffee and wait for the rain to clear up. We ended up at a table with 6 other dutchies (what are the odds) so it was a cosy wait. And it did clear up! In clouds and drizzle we made the last kilometers to the top, where it started the clear up right when we reached it. So we managed to see the Torres! J The way back was a very sunny one. All in all a beautiful hike, and definitely recommended if you only have time for one day hike in the Park, or want to experience a bit of the W hike. But we did see the consequence of the popularity of this trek. When it got later in the day we sometimes had to pass long traffic jams of people, all walking with the same rental gear. We were actually quite happy not to do the whole trek, I can only imagine this to be very crowded all along the way. Back at the ‘campsite’ we chatted with all our overlander neighbors and went to bed early! We could definitely feel the 27km in our legs! The following day we moved more North again in the park. We had a quick stop at the Paine waterfall, and then moved on the check out the Lago Azul campsite. We read on iOverlander (an app we use everyday, has information on campsites, free camping, gas stations, shops etc. along the way, and is made and kept up to date by all people currently overlanding. We cannot do without!) that there exists a free campsite (with hot showers) but it was marked as closed. We wanted to try anyway, and found the campsite open! And the view was really beautiful!! Good thing the weather worked with us as well (20 degrees and sun) so we decided to stay another night in the park to enjoy this! Now we are in El Calafate and slowly make our way up North through the different parks we find along the way. We had a little problem with our car, and were afraid we would be stuck here for a longer while to get it fixed. But we consulted with our Land Rover mechanic in Holland and here in Argentina and got told it’s not a serious issue. So we solved it ourselves and are on the move again!